Many of you have been waiting for today's intro, right? Well, without further delay, here is Reindeer Games -- a delightful set designed by our very own Angela in her trademark style! I love it, you love it, we all love it! Here's my first card of the day and it also shows you a peek of the Snow-capped Mountains Creative Cuts die set that will also be available October 15th! It is a new hill style border set complete with separate snow for each mountain top! The houses are from Christmas Scene, which I discovered works perfectly with Reindeer Games to create the perfect outdoor scene. Oh there's that little tag again! I wonder what surprise we will reveal soon? I created a shaker card here with Reindeer Games. You may recognize Rudolph leading his pack of reindeer pals. The sentiment is from Jingle Greetings which we'll see later! Who is excited to bring these Reindeers home? Raise your hand! This set is probably the best Christmas stamp set I have seen released this year! I will so be picking this set up on the 15th! Amazing job Mama Elephant!!! those are without question the most cutes reindeers I ever saw!!! I need to buy them!!!! great job for the designers! I'm so glad I haven't purchased any Christmas stamps this year. I've been waiting for this one!!! I love this set is one top of my list, it doesn't get cuter than this! Love the scene with the snow-capped mountains. the little guys are so cute. Wow! This is amazing! The mountainsssss and those cute reindeers!!!!!!!! Ohhhh my ...just toooo cute for words..
My hand is for sure up! Those reindeer are darling! I do,I do!!! Love these lil deer and I'm super excited about the Snow-capped mountains die! I spy a little cute tag too :) Adorable cards as well! Oh my word!! how cute are these? I NEED this set!! This set is the best Christmas stamp set this year...Just georgeus...Thanks ME for beutiful TOYS!! Oh, sooo cute!! Love, love, love! Must. Have. Now. These are too incredibly cute!!! Can't wait til the 15th!! So cute love these reindeer. Who could resist these cuties?!!! Me, me, me *raising both hands*, I'm loving this set!!! Awesome cards, Kryssi!! Oh my goodness!!! Those little reindeer are absolutely adorable!!! Gotta have!!! I'm so in love with these little reindeer!! This is just adorable!! Love Rudolph and his merry gang in the shaker card! 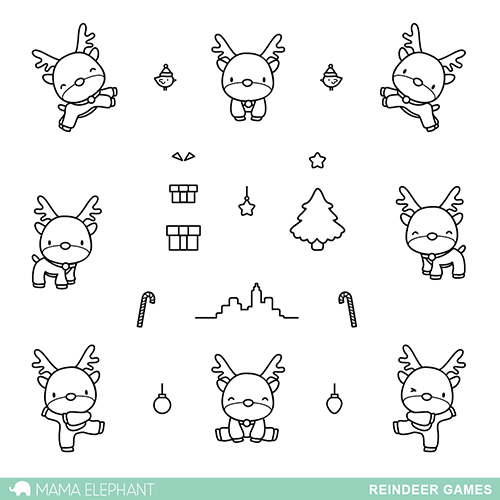 I am loving these cute little reindeers and their cute little games. Your cards are so adorable! I love the snow capped peaks and houses too. Could these be any cuter? I think not! I raise my hand and think I totally may have to purchase these. Thanks for all the great stamps! I am spending more money then I should but it's way worth it. Love love love the reindeer! Such an awesome Reindeer Games stamp set. I so want it!! Both hands up over here!!!!!!! OK I cannot live without this, I want to stamp them on everything all year round! Payday needs to come NOW! I have to buy this set as soon as possible! OMG cuteness overload - those reindeer are just adorable. How cute, and I love the mountains! Adorable... brings the kid out in me. And, I love the snowcapped mountains and Christmas scene! Great job, Mama Elephant! This by far is my FAVORITE!!!!! Gorgeous, so cute and so perfect, best reindeer stamps I've seen! Love them!!! I NEED these reindeers! No doubt! They're perfect and I want to cuddle all of them! Super cute!! Love those little reindeers!!! Would make some cute Christmas cards!!! So adorable! Love these little guys!! Oh, those reindeer! I want to gobble them up!! !